President Trump yesterday announced a 25% tariff on imported steel. Good news for American steelmakers but not so good for American Steel users. He also slapped aluminum with a 10% charge. The news came as a surprise to the stock market. The Dow displayed its displeasure with Trumponomics by tanking 420 points. And it opened this morning down another 320. The news from Dan Henninger in the WSJ yesterday morning (before Trump’s announcement) was that the president is obsessed with jobs. Every president claims to be a jobs president, but after a year it is becoming clear that this may be the only thing Donald Trump thinks about. 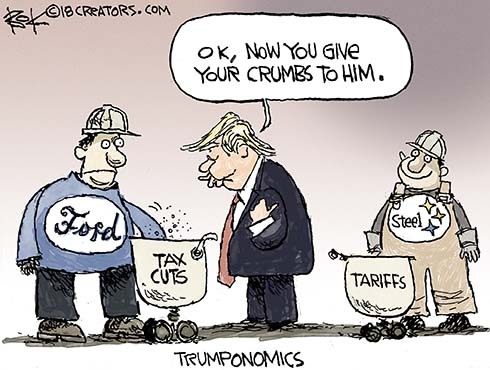 He may even impose tariffs soon on imported steel, seeing only the protected jobs in front of him and missing the larger loss of jobs in steel-using industries. But the bigger surprise might be that Trump’s keeping his campaign promises, from tax cuts to tariffs.